More Than “Accessible Items” – Integrated Play Environments! Other companies see a child in a wheelchair and provide an elevated sandbox. Grounds For Play sees the emotional needs of the child and provides an integrated sand experience using the Corner Chair. While the elevated sandbox provides access to sand, the child needs access to play with his peers in an integrated setting! Use appropriate surfacing. A key to creating an accessible play area is the coordination of the various surfaces on the playground. Transitions from pathways to grass, from ramps to pathways, and from resilient surfaces to pathways must be planned to create access for children of all abilities. Incorporate accessible play elements. Your Design Consultant can help you incorporate play components that all children can easily access on either ground or deck level. Support and foster growth and development. An inclusive play environment should include a variety of products that provide children with opportunities to develop social, sensory, cognitive, and physical skills. 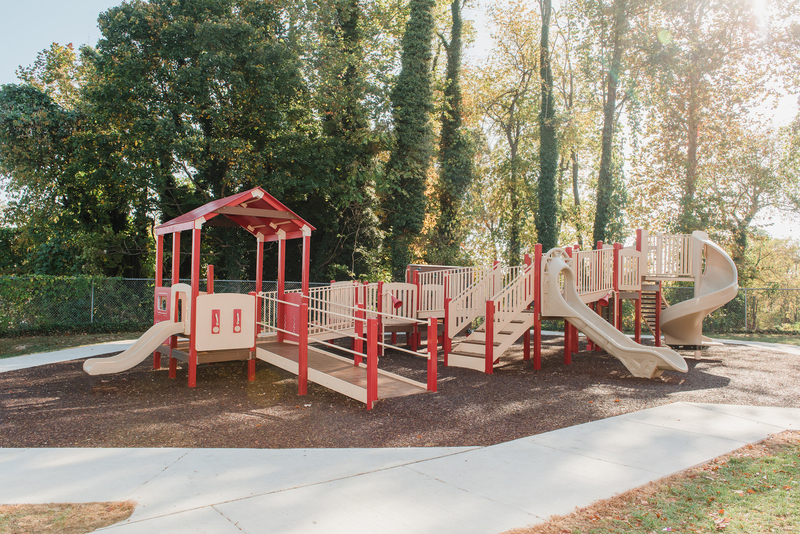 Grounds For Play provides full service playground development, from design through site preparation, safety surfacing, landscaping, and paved pathways. It is this seamlessly integrated approach that makes truly integrating environments possible. Let's work together to capture the unique spirit, vision, and character of your project. Contact us to get started!